If you're like a lot of other Mother's Day shoppers, your mom may have had to settle with a card or phone call. H.BLOOM, a gift delivery service, could help you make it up to her. The company recently launched its first customer-facing mobile app, which enables customers to send gifts (flowers, treats, etc.) with a few simple taps on their iPhones and in increments of their choosing (one time, weekly, monthly, etc.). To bring this app to life, H.BLOOM enlisted Two Toasters, a mobile app development firm, to provide an intuitive, yet high-end gift-giving experience for delivery in select cities. "H.Bloom is focused on delivering products and services that people love, and the new mobile app is a key element of our overall strategy of delivering the finest quality flowers and gifts to consumers and businesses," said Emily Dubner, Director of Consumer for H.Bloom. Seamless Checkout - Two Toasters developed a "stacked six-step checkout process" to enable customers to change a specific part of their order, without having to backtrack through the ordering process. *Calendar Functionality - This makes it easy for customers to see available days with delivery fees clearly displayed at the top. 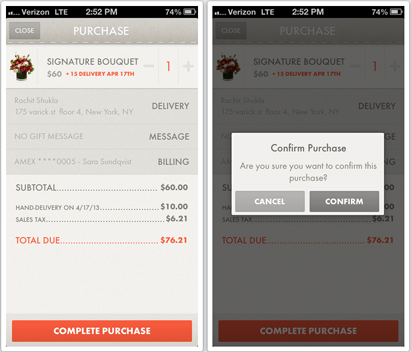 This eliminates user frustration and increases conversions, as delivery costs are a common reason for cart abandonment. Sreamlined Design - Two Toasters purposely kept the design minimalistic, keeping the gift options screens minimal to not clutter the user experience. 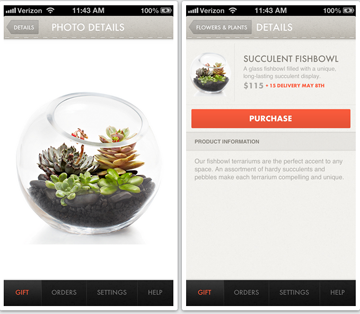 To download the H.BLOOM app for iOS, click here. To learn more about Two Toasters, visit their website.